Worries of a Lehman-like financial crisis spreading through Europe and the world has made Greece talk of the market lately. No to let Greece dominate the spotlight, the U.S. debt ceiling debate is also getting to be as traumatic since a failure to raise the debt ceiling could mean imminent default and credit downgrades for the United States sovereign debt. In the midst of all these different crises, global markets rise and fall in lockstep with news coming out of Europe and the U.S. The U.S. stock market, after suffering a correction phase since April, snapped back last week, scored the best week in two years, but only to retreat again after the long July 4th weekend. The commodity and currency markets are not immune either with investors switching back and forth between risk-on and risk-off trades. In this environment, one has to ask … Are there other indicators signaling a global market doomsday? According Oxford Analytica, there are fifteen “Global Stress Points” ranging from medium to extreme high impact to the entire world. These are listed below ranked by its potential impact by Oxford (See Graph). 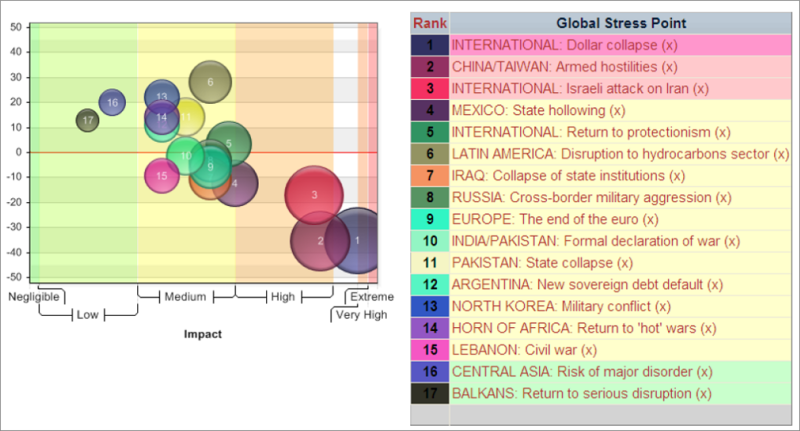 Around 60% of the “stress points” are related to geopolitics, war or unrest, while only about five events could be classified as financial crises. For all the rage in the press, Euro’s demise is surprisingly not as big a deal as, for instance, China making good on its 60-year threat to Taiwan, or even a much more mundane “global protectionism”. And hate to disappoint China Bears, it seems whatever problems China has, it is not the one that’ll tank the world like the Dollar and Euro. A narrower spread between rates on Treasury bills and other short-term credit or near substitutes, e.g. LIBOR – This would be a sign of waning faith in the U.S. government. Price spikes in U.S. CDS (credit default swaps, insuring against a U.S. debt default) – According to Markit, the most noticeable movement has occurred in 1-year spreads, which have converged closer to 5-year spreads, and is up about 430% since early April, while 5-year CDS also has risen about 46%. ﻿﻿﻿﻿﻿﻿﻿﻿So far, out of the 20 signs, there’s one that’s sending up a red signal flare – U.S. sovereign debt CDS, which is directly linked to the dollar (See Chart Above). The U.S. does not have control over many of the indicators listed here, but at least the No. 1 risk factor –the U.S. dollar–is influenced by the national debt and by the monetary and fiscal policies set by the U.S. government and the Federal Reserve. 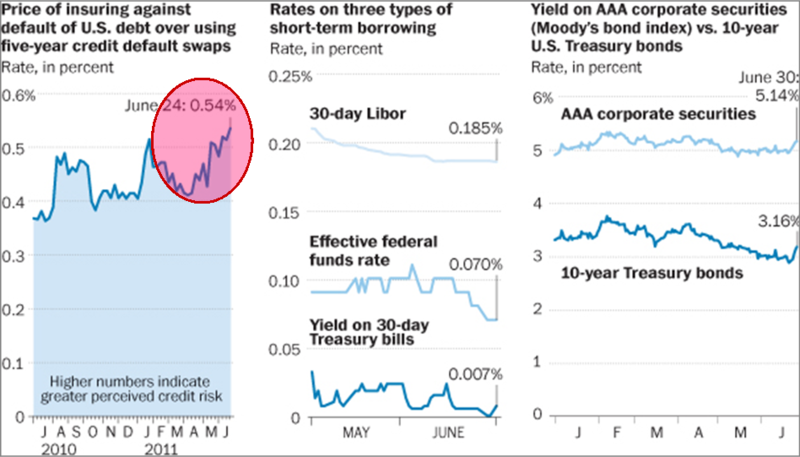 The longer the debt ceiling debate lingers, the more likely the bond market would start reacting and demanding higher interest rates. A sovereign credit downgrade as a result of missing the debt ceiling deadline would just translate into billions more in interest payments, piling on to the existing debt. The United States is not like Iceland or Argentina, resorting to default as retorted by some could mean calamity not only to its citizens, but also to the rest of the world. Unless the government and this Congress get their act together, there will be no bailout, and instead of one lost generation to the Great Recession, there could be multi-generation missed in the next Grand Depression. Source: Dian Chu, EconMatters, July 6, 2011.